I am nearly always a great supporter of Mary's wardrobe choices, but this dress looks dreadful to me. Giant handkerchiefs attack! Both are nice dresses. Really different styles. But I think none of them is proper for a this dinner. Perhaps cocktail dresses would have been better. Hmmm.. colorful. I give Victoria credit for doing her own thing with her fashion choices. Can't help but wonder though, lots of camouflage the last few days.. baby bump? On a dû dire à Mary qu'elle était trop élégante pour Victoria,alors elle a mis ces horreurs ! 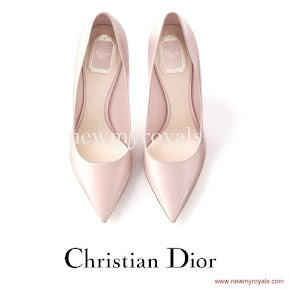 Longtime looker, first time commenting. 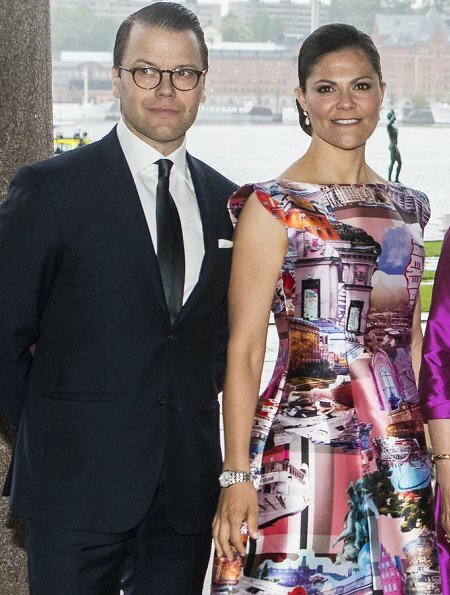 I find Prince Daniel quite dapper. 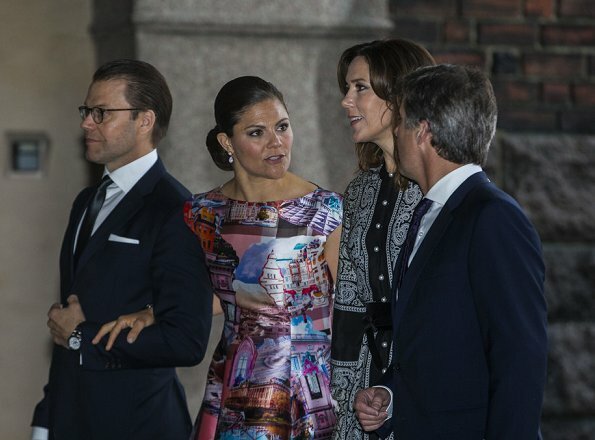 CP Frederik always looks like a boy in a too-small suit jacket. Agreed. And what was Mary thinking? 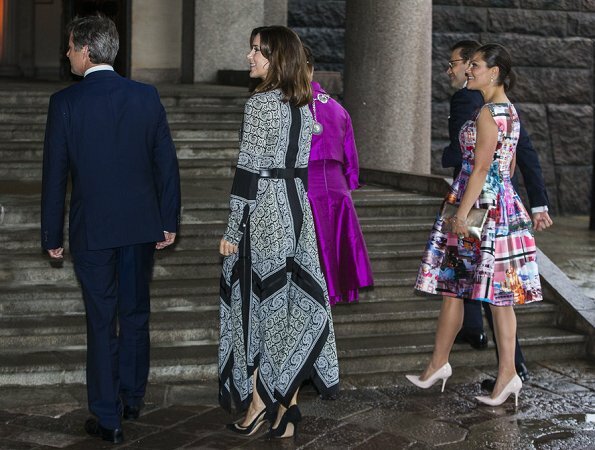 I love Victoria's dress and think she looks stunning - the styles, the colours, the print. I don't especially like Mary's dress - it's a bit beach holiday for me. I like her shoes and the messy curls of her hair style. 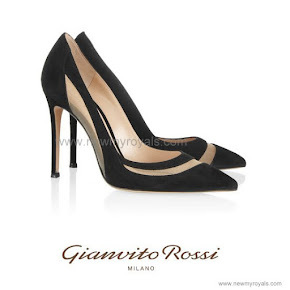 Agree that her shoes are fab. Also like her hair in the loose curls. Just hope she never wears that dres again. Exactly. Mary´s dress is not my taste at all, but if I would ever consider wearing it, it would be in a casual setting. It has a bohemian, slightly hippie touch to it, and it will never work as an elegant lady´s dress, let alone for a dinner. So, I think it´s styled totally wrong and thus looks odd. Hmm, Victoria's dress is very interesting. I feel like her past two dresses have had weird prints, but she still looks great in them. I do wish she would wear her hair down or in a ponytail or something. 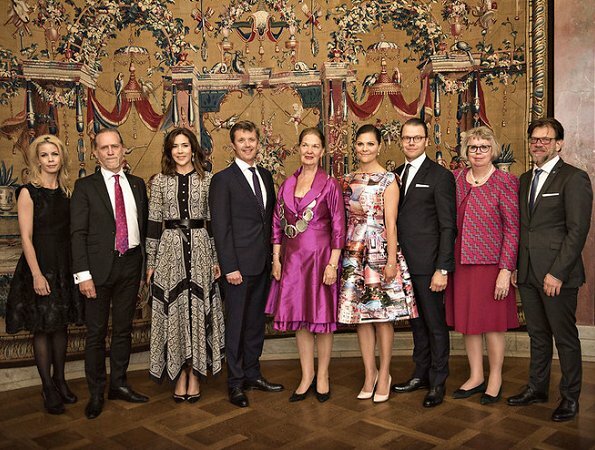 I completely agree, Mary's dress looks like something for a holiday at the beach, not an official dinner. It's a nice dress, just too beachy and trendy for my taste. It looks like everyone is dressed for a fun time and the style each woman chose really suits her well. Mary's hair must be drooping the wet weather. 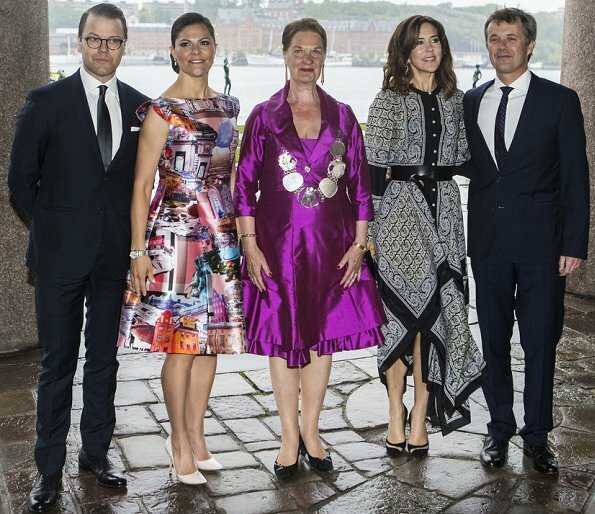 I can't help but compare Prince Daniel's style of suit with King Felipe's. 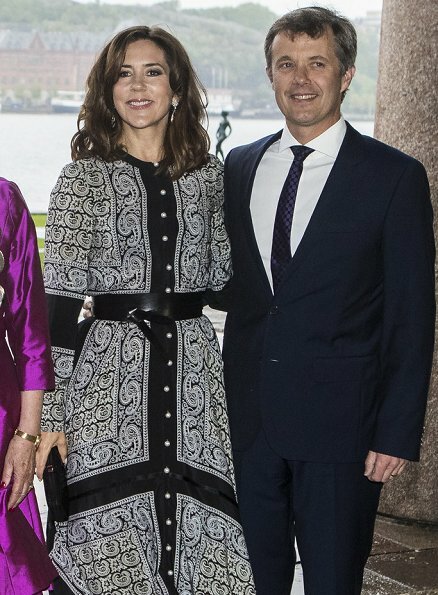 Daniel's pant legs are so tight that they are all rippled and so are prince Frederik's. In contrast, King Felipe's drape nicely and you don't see his legs all outlined. He looks more polished, I think. This time my points go to Victoria. Sorry but I do not like the dresses. Victoria's dress looks too girly prom dress and Mary's dress too old for her. Both of them strange styles. Victoria's too shiny and with weird building pictures (I've seen similar curtain fabrics). Mary's dress looks too dark and grey, the skirt with uneven hem totally ruins it. Dissapointed in both ladies. Yes ! Au Festival de Coachella ! Victorias is best I like the pattern and that she dares be so cuolorful. Marys dress looks like it not fit in bur is nice in itself.